dare to cook an authentic paella or flip an omelet? 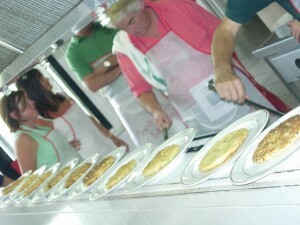 Where: all over Spain at cooking schools, kitchens of restaurants, or any prepared room for cooking. Nº of participants: from 10 to 200 people depeding on the city. Cooking a good paella or spanish omelettes is not as easy as you think. Did you know you must hear the rice sing in order to know when it is already cooked? Do you know what kind of grain to use? This is a didactic and participatory competition for those who want to have fun and want to learn how to cook an authentic paella and a spanish omelet, besides learning different recipes or versions of them.